Keystone Window of Pennsylvania’s vinyl replacement windows and doors are virtually maintenance free! However, as with any product exposed to atmospheric conditions, they will become dirty and require cleaning. In most cases, exterior dirt and grime will wash away during the next heavy rain storm. If you should choose to clean your vinyl windows, however, these tips will help you retain the “just new” look of your windows for years to come. Always clean the frames and sashes with a soft cloth or ordinary long-handled soft-bristle brush. Do not clean windows with high pressure sprays, guns, or hoses. Note: If you choose to use a mildly abrasive cleaner, such as Soft Scrub with bleach, Ajax, Bon Ami, etc., please be aware that these abrasives may affect the appearance of glass and vinyl surfaces. 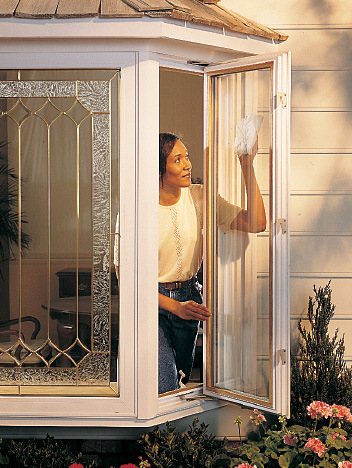 Be sure to test the effects of these cleaners on a small, unseen portion of the window before proceeding. DO NOT use cleaners containing aggressive organic solvents because they could affect the surface appearance of the vinyl. Examples of such cleaners include: chlorine bleach, liquid grease remover, strong soaps and detergents containing organic solvents, nail polish remover, and furniture polish and cleaners. IF IN DOUBT about how to clean your windows, hire a licensed and insured professional window cleaning service, or contact us and we’ll be happy to help answer your questions.